Unfortunately, felines are rather prone to cat urinary health issues. When they do occur, they can be upsetting to watch and difficult to manage. Your furry friend doesn’t know what the matter is, or how to stop it. As we all know, cats have a keen sense of embarrassment. They have a lot of pride, and they hate to have it dented. That’s why they always run away after they’ve done something silly, like falling off the windowsill. A toilet trained cat will feel as bad about missing its litter tray when it’s ill as you do when you clean up after it. In a lot of cases, what’s actually happening is that your cat has learned to associate the litter tray with painful urination, and is avoiding it on purpose. Now it’s scared of going back to the litter tray, but doesn’t have anywhere else to go to the toilet. Chances are, it’s just as worried and confused as you are. Cat urinary health is a complicated issue, and there are whole fields of science dedicated to better understanding the issue. In fact, the latest scientific theories on cat urinary health have changed in just the past few years. It’s only five years ago that cat urinary health issues were blamed purely on diets that were high in ash and magnesium. Now the focus is more on water intake, and pH level. Science is advancing all the time, and so is best practice based on it. Hopefully one day soon, a perfect cure will be found, and the problem will be a thing of the past. In the meantime, let’s do our best to help and understand our pets during periods of discomfort. In this post, we’re going to be looking at why cat urinary health issues occur, and what we can do to help. Why Do Cat Urinary Health Issues Happen? If anybody told you that they knew for certain, they’d be a liar. As we said, thinking on this is evolving and changing all the time, and the search for a definitive answer goes on. There is, however, a lot of evidence which suggests that it’s connected to diet. The pH level of a cat’s urine also plays a role, but then it only gets that pH level from the food that it ingests. There are a couple of potential causes. These are two very common reasons for cat urinary health issues, and they form for different reasons, although they’re triggered by different elements. In either case, a build up of a crucial ingredient in food – either magnesium, protein, phosphorous or calcium – forms in the urine. Because of the excess quantity of the element, the built up deposits aren’t dissolved in the urine as they should be, and so form crystals. The crystals, in turn, create blockages. There are specialist diets available which claim to specifically target either bladder stones or urinary crystals. We don’t dispute that they can be successful in curing what they set out to target. Unfortunately, the issue is that they usually do it by providing less of the element that’s causing the blockage, and more of the elements that aren’t, which creates an excess of the alternative elements. As such, a food which cures bladder stones can actually cause urinary crystals. The reverse is of course true as well – a food that cures urinary crystals can cause bladder stones. Despite the plethora of specialist food products available, it may actually be best advice to avoid these completely, and instead follow the advice that we’ll give you later on. Feline Lower Urinary Tract Disease is one title that can cover a multitude of different issues. It’s also a more serious problem than basic urine crystals or bladder stones. If you have reason to suspect that your cat is suffering from Feline Lower Urinary Tract Disease (which we’ll call FLUTD from now on), the best advice is to see a vet at the earliest opportunity. The condition can be fatal if left untreated. Symptoms of FLUTD to watch out for include frequent or painful urination, blood in the urine, loss of bladder control, crying out when urinating, vomiting, lethargy, increased water consumption, and frequent licking around the urinary opening. The condition may also occur as a complication or linkage to a pre-existing health condition within your cat, such as diabetes or hyperthyroidism. Urinary Cat Food: Can Certain Foods Prevent Cat Urinary Health Issues? If your cat doesn’t currently have a urinary health issue, the best weapon in its defence against it is good old fashioned water. While there is specalist cat food for urinary health, crystals and stones are unable to form when the urine is sufficiently diluted. 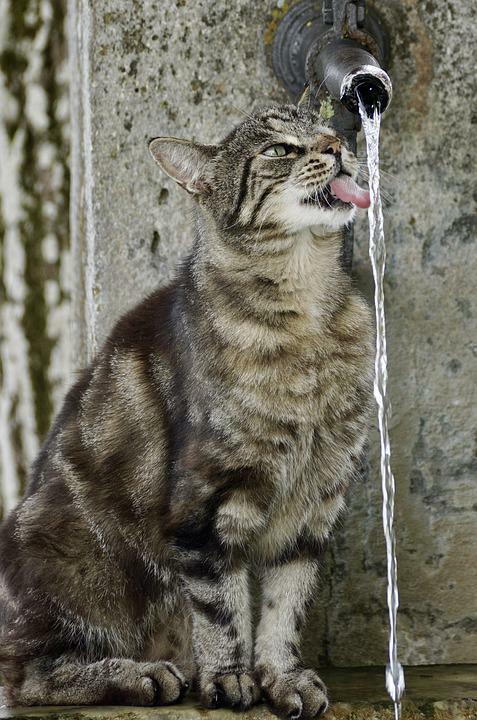 Whilst that sounds nice and easy, we know that most cats don’t drink all that much water. They should do, because it’s essential for good cat kidney health. Sometimes it feels like cats don’t help themselves much, but there are ways to bribe, cajole or otherwise persuade them to boost their intake! Purchase a cat water fountain. Cats have a very keen sense of what’s clean and what isn’t. That’s why they wash so often. Water that’s been in a bowl for more than an hour or so becomes stagnant to a cat. They’ll have very little interest in drinking it. They much prefer to drink running water. That’s why they’ll often come to visit you for a lick of the tap when you have it running. Evolution has hardwired into their brain the idea that running water is clean water. Cat water fountains simulate the type of running water they’d find in the wild, and so they’re more likely to drink from them. Place water bowls in several rooms of the house. Cats like new things, most of the time. They’ll always investigate changes to their environment, and if they find something their to their liking, they might use it. A good bet is somewhere you and your cat spend a lot of time together. A living room, or your bedroom, would be a good place to start. Walking away from you all the way to the kitchen to get a drink may not be worth it in a cat’s mind. A quick hop across the room is easier to bear! Mix a little chicken or beef broth into their water. This is outright bribery, but who cares so long as it works? If your cat’s water tastes like food, they’ll be more interested in it. Don’t go overboard, just mix a little bit in to give them the taste and they ought to lap it up. There’s no need to feel guilty about tricking them, the extra water is good for cat kidney health so it’s in their own interests. By the way, this and all the advice above also works if your cat is suffering from diarrhea. Talking broadly, wet cat food is better for cat urinary health than dry cat food. That’s because there’s a great deal of moisture in wet cat food. A normal, healthy cat can actually get all the water intake it needs from wet cat food alone. That’s not to say that dry cat food is bad – it has many practical benefits. Our advice would be to feed your cat a healthy mixture (although not in the same bowl!) of wet food and dry food. As an extra precaution, check the packaging of any dry cat food you buy regularly for the pH balance. Some dry foods will actually feature that prominently, and it’s a desirable trait. If the pH balance isn’t listed on the packaging at all, that’s generally not a good sign! Vets advise that somewhere between 6.0 and 6.5 is a healthy pH level. Consider formal cat food for urinary health as well. What If My Cat Already Has Urinary Health Issues? Cat kidney failure? Poor cat kidney health? Kidney disease is just one of the issues that can have a knock-on effect on the urinary tract. If your pet is already suffering with cat urinary health issues, then a change in diet is probably necessary, even if your furry friend resists it. Your vet should be able to give you some guidance on what to do and what not to do – again, if your cat is experiencing symptoms like the ones we discussed above, don’t waste time searching the internet for answers. It might be a health emergency, and you should act quickly. A good vet will give you plenty of health and diet tips. By and large though,you can make toilet visits more comfortable for your cat by following a few basic steps. Cut out fish from their diet. Sorry, however much they love it, it has to go. Fish is more likely than any other food type to cause crystal formation, and that’s only going to make your cat ill. They’re just going to have to find a new favourite food. Boost their wet food intake. There are some cat owners who don’t feed their cats wet food at all. Dry food is easier to serve, and smells better, so we understand the logic. Unfortunately, it’s not in your cat’s best interests; especially if they have a cat urinary health issue. Wet or canned food contains all the moisture that a cat needs to keep the urine diluted. It’s still important to avoid fish, though. Even the fish content in wet food can cause problems for a poorly cat. Boost their water intake. See above for the advice we gave on preventing cat urinary health issues before the start. It’s doubly important for a cat who already has a problem. Like we said, consider a water fountain, mix in some chicken or beef broth, and add more water bowls to your home. Stop feeding them scraps. We know that this can be a really hard habit to break. Especially if your cat is used to getting a little something every time you open the fridge, or eat a hot meal. Cat food is carefully calibrated and balanced to take into account the complications of feline digestive systems. The food you’re eating is not. If cat urinary health issues are present, it’s best to know exactly what your cat is and isn’t eating, and so it can’t eat human food. Whatever urinary cat food may or may not be, it certainly isn’t what comes from your table! Although we’ve stressed how important it is to see a vet straight away if your cat displays symptoms of cat urinary health issues – and if you didn’t get the message, we’re stressing it again here – it’s important to remember they’re not the end of the world. As we said at the start of this article, cat urinary health issues are common, and most cats will have at least a minor one over the course of their lifetime. Anything cat set them off in a previously healthy cat, and often it’s down to nothing more than stress. There are many things that can stress a cat that you wouldn’t normally consider – anything from a housemate they didn’t take a shine to, to a small move in the location of their cat bed. That’s a big deal to a cat! Cat urinary health issues aren’t likely to be fatal so long as treatment is sought. As long as the cause is identified quickly, it’s not even a life limiting condition. Your cat can live a long and comfortable life with a urinary heath issue if you take care of it and make sure its diet is adjusted accordingly. In fact, most cat urinary health issues can be completely cured. Very few of them are life long! A cat who’s suffered with one once, though, is more likely to suffer one again – so always be vigilant against changes in behaviour, and always bear the advice we’ve give you in mind. Thanks for stopping by our site today and reading our article. We hope it was useful to you. If it was, please share it among your cat loving friends! My Cat Stopped Meowing – What Does It Mean?